Looking for another inane way to waste countless hours? 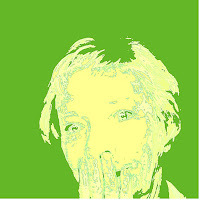 Try the Warholizer (http://bighugelabs.com/flickr/warholizer.php ). See the cool, green self-portrait I made with it? Or make yourself a whole deck of trading cards, like I just did. Each one has a photo of a different bird, all taken by ME. Now what do I do with them? Technology is the topic for today. Like many people, I have a love/hate relationship with it. Right now, I'd just like to have enough knowledge to choose my first laptop, and maybe a GPS system...and maybe an I-Touch. And a little home music system with a docking station for my new I-Pod. And I'd also like enough money to buy all those toys. As for the online stuff, what interests me most is mastering the tools for downloading and editing photographs. I have a Kodak Easy Share camera with a good, 10x zoom, so I've mostly been using the Kodak Gallery website tools. But lots of people have told me Google's Picasa is better. I want to try it next, after I finish familiarizing myself with what Flickr has to offer. The most mind-blowing thing about the Net, to me, is the amount of up-to-date information that is now at our fingertips. That has never been true, in the history of the world! As a result, the balance of power has shifted. For instance, when my HMO refused to cover a particular test I felt was needed, I quickly and easily did some online research, wrote up my argument providing plenty of documentation, and mailed off an appeal to the California Dept. of Managed Health Care. They agreed with me! And the HMO was instructed to pay for the test once a year. In the past, I wouldn't have had a clue where to find that information. And "information is power"-- right? Google Earth, more than any other site, makes me shake my head in wonder. Wow! How cool is that, to be able to zoom in on the back yard of a friend who is now living in France?! Of course, people can zoom in on our yard, too. That's okay. I'm a little more dubious about the value of some of the Web 2.0 stuff, though. My initial enthusiasm for Facebook, for example, quickly waned when I saw how SILLY and pointless lots of the so-called communication that goes on there is. But I'm trying to keep an open mind. Maybe this "27 Things" experience will change my mind. 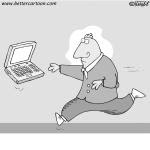 Twitter, here I come! It's awesome that you took control, did the research and successfully advocated for yourself. I have always wanted to make a deck of cards for my sister with pictures of roses or her grandkids on them. Now I know how! Thanks. Great blog.